When you have great credit, and obtaining new credit products is a breeze, you probably don’t worry too much about financial stressors as far credit reporting. However, if you think you have (or know you should have) great credit, but for some reason are having trouble obtaining financing, this may be a result of a credit reporting agency reporting a mistake. 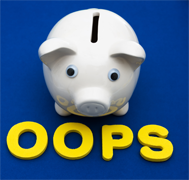 Mistakes happen all the time on the credit report, and many people are unaware that these mistakes exist. However, even one mistake can have a major impact on your overall score and so these errors need to be remedied right away. Here is some advice about fixing your credit when credit reporting agencies are reporting mistakes. Firstly, understand that credit reporting agencies can be really difficult to deal with – they have large, autocratic, impossible processes which make fixing mistakes seem almost impossible. That being said, you need to be diligent and don’t let the process get you down. Step one in fixing your credit is to request your credit report – that goes without saying, and if you’re looking to fix mistakes on the report, you’ve probably already done this. Great, move on to step two. Step two: initiate the dispute. You do this by filling out a dispute form and submitting it. Here is a link to the Equifax Consumer Credit Report Update Form: http://www.consumer.equifax.ca/dispute-ca/canada-cr-update-form/en_ca. Step three: create and send your package by registered mail. This will ensure that Equifax receives the package and gives you evidence that it was sent and delivered. The package needs to include the above form as well as photocopies of all necessary documents and identification (ex: receipts, legal documents, 2 photocopies of pieces of valid identification, including proof of current address). Step four: one month later, check your credit again. If the error has been fixed, perfect, you’re in the clear. If not, the issue needs to be escalated. To do this, you may wish to contact your provincial regulator responsible for consumer affairs or you can also contact the Federal Privacy Commissioner. Additionally, if the incorrect information comes from a federally regulated financial institution, the Financial Consumer Agency of Canada (FCAC) website provides additional information on how to get errors corrected: http://www.fcac-acfc.gc.ca/Eng/resources/publications/creditLoans/Pages/Understa-Comprend.aspx. Your credit report and what is contained within it is important – it can dictate a number of different things in your life, and errors or inaccuracies can seriously impact your ability to obtain credit. Don’t let mistakes stand in the way. Need credit but know your credit score is not so great? Don’t worry, Prudent Financial provides credit to even the most bruised credit, including undischarged bankrupts. Contact us today at 1-888-852-7647.